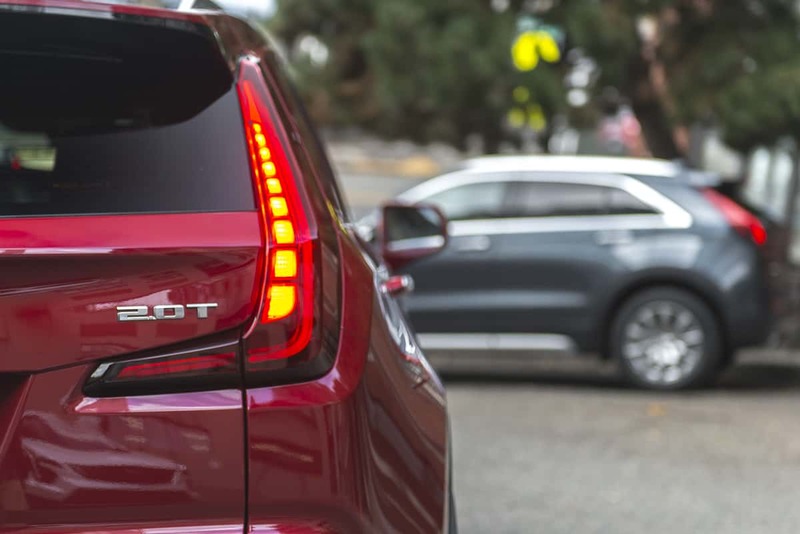 Seattle, Washington – Truth is, with a new subcompact crossover hitting the market, like, every other week the hype begins to wear off. And in the luxury segment, you may question if premium quality takes a hit as carmakers rush to enter the thriving market slowing flooding with these nimble little utilities. When I first saw the 2019 XT4 for its global debut back in March at the New York Auto Show, that’s how I felt, to some degree: a good looking American premium small crossover that lacked that upscale interior you’d expect from a brand like Cadillac; basically, a shrunken down XT5 (Cadillac’s mid-size crossover) with less of the good stuff to keep the price down. But I digress. Either the coffee didn’t kick-in back in NYC that morning, or it’s clear Cadillac’s new entry truly exhibits its chops off the gleaming press stage and on the windy roads of Washington State where we spent a couple days putting the subcompact hauler to the test. A late entry, but you could say Cadillac took their time with this one, offering everything you’d expect from the premium brand, just in a smaller package. The new XT4’s exterior styling is sleek and sporty, the interior is as luxe as you’d expect from the brand (no cheap plastics) with proper fit and finish, the cabin offers the most rear legroom in its class, and the new 237-hp 2.0L engine provides ample power when needed, paired to a new brake system and 9-speed transmission. 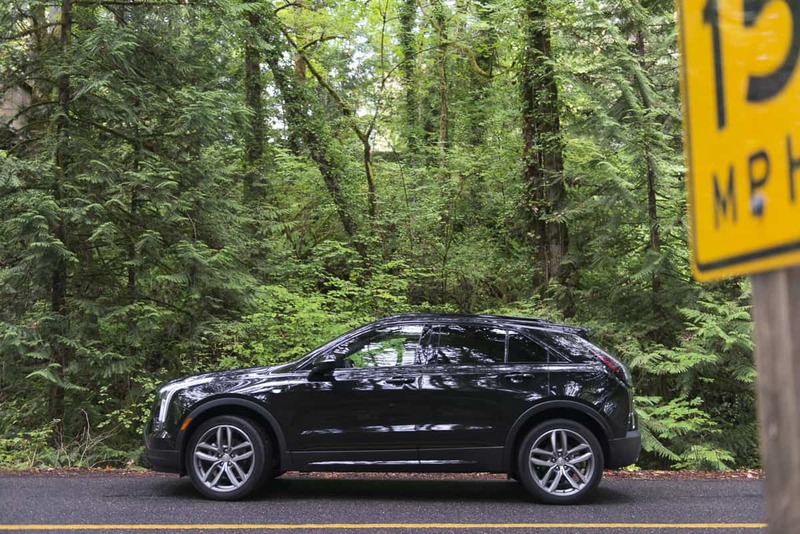 The 2019 XT4 is an all-new Cadillac offering built on its own platform and architecture. It shares similar design cues with its slightly larger XT5 mid-size sibling which replaced the outgoing SRX in 2015. Cadillac’s growth strategy to 2020 is bold; they plan to release a new product every 6 months for the next 3 years. Whereas the new 2015 XT5 kickstarted the brand’s new rebranding strategy when it first debuted, the 2019 XT4 is the first product out the gate paving the path for this ambitious growth offensive. 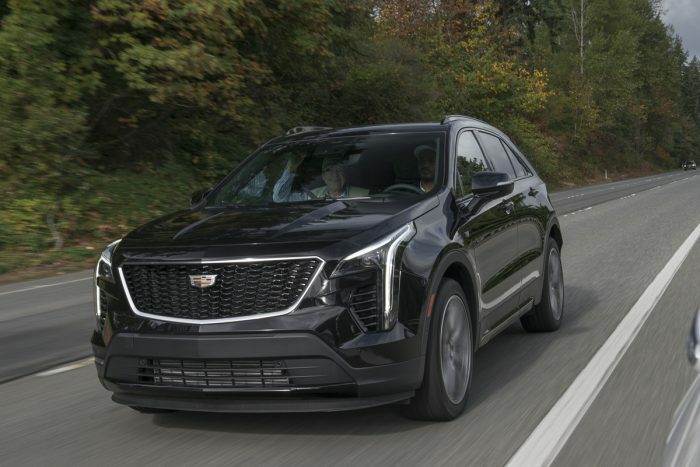 The company’s award-winning Super Cruise Hands Free Driving feature isn’t fitted in the XT4 but we expect all Cadillacs to include this by 2020. Read our full Super Cruise review here. Cadillac stuck with the 2.0L formula, but completed revised the powerplant for the new 2019 XT4 while shedding 15 lbs of engine weight despite all the added tech. The new engine is powerful enough for a small crossover, putting down 237-hp at 5,000 rpm and 258 lb.ft of torque at 1,500-4,000 rpm. With nearly 240 horses under the hood, Cadillac’s new entry boasts the most horsepower in its class. 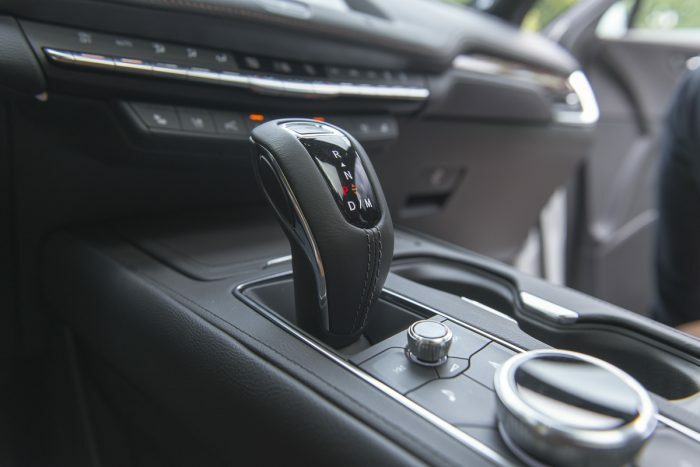 Remember the days of the 6-speed automatic transmission? Yeah, well those days are numbered. Today’s new vehicle trannys are getting more gears, and the new XT4 is no exception, fitted with a 9-speed transmission with wider ratios compared to Cadillac’s 6-speed version. These extra gears are all a good thing. They offer smoother, more appropriate shift points on the road while overall providing significantly better fuel efficiency. On the open highways, the XT4 handles well. The new valvetrain produces power when needed and torque figures see around a 12%-improvement over the outgoing 2.0L engine, which helps when passing those slow pokes or merging at high speeds. The XT4 may be small and nimble but it’s not a sport sedan, obviously. But it handles high-speed cornering well; the new brake system offers on-demand stopping duties and is exceptionally responsive. Add the XT4’s all-wheel drive to the mix with its twin clutch system and you’re good to go. Again, this is the largest subcompact crossover in the segment. Why should you care? Because that equates to more cabin space – and that’s always a good thing. Especially for passengers in the back who get the most legroom available compared to the competition. For some reason, based on my recollection from the New York Auto Show, I was expecting a watered-down interior with plastic bits and a humdrum layout (blame it on the bad coffee). In reality, our tester was anything but those things, especially when you step up to the Premium Luxury and Sport trims, as you see in these photos. Even at the entry-level Luxury trim the XT4 gets a good dose of standards including 8-way driver/6-way passenger power front seats, aluminum metallized interior decor, 4 USB ports, dual-zone automatic climate control, Leatherette trim, and adaptive remote start. Best thing Cadillac did (along with competitor Lincoln) is get rid of the annoying finger-swiping controls that were difficult to use. We’re now back to the good old hard switches and buttons. The centre stack layout is well done inside the XT4. The screen sits at a bit of an angle, and personally, happy not to see a large, floating tablet style touch screen cropping up in other luxury vehicles these days. This setup here is clean and elegant, and the switches housed below aren’t huge and get tucked away without disappearing so they’re easy to access. The driver gets a new thick, three-spoke, leather-wrapped steering wheel along with sport-inspired seating with beefed up seat-bottom and seatback bolsters (optional seat massage function available). Sitting inside, the space feels more compact and less subcompact. This extends to the cargo space as well, offering 48.9 cubic feet (1,385 liters) of maximum cargo volume with the rear seat folded. As you’d expect, this little crossover is jammed with new tech, including GM’s popular available embedded 4G LTE connection. Overall, the Cadillac’s intent is to provide consumers a smartphone-like experience with an intuitive interface, faster response and improved voice recognition that can be updated over time to meet a their evolving connectivity needs. Size matters, and for customers shopping for a luxury subcompact that feels more like a compact, Cadillac’s new entry might fit the bill if the larger XT5 isn’t in the cards. This all works with what the company calls Cadillac user experience. Notable features include the 768p HD resolution 8-inch screen, an available next-generation 15-watt wireless charging the brand says will offer faster charging times, an SD memory slot with the navigation upgrade, Near-Field Communication which speeds up phone pairing duties (a must for Millennials if you want to come out alive), and the safety alerts like the available Surround Vision and second-generation Rear Camera Mirror. Oh, and Teen Driver. Design-wise, Caddy’s new crossover looks fierce with those sharp lines and smooth panels. Especially in the top Sport trim with a gloss black mesh grille inspired by Cadillac’s high-performance V-Series models, gloss black window moldings and specific Sport alloy wheel choices (see in our pictures here in black). On that note, the XT4 Sport also finds body-coloured door handles, Leatherette trim with sport accents, carbon fiber or wood interior décor, and a sport steering wheel and pedals. Despite its small size, the XT4 looks poised and confident. But of course, that’s all personal taste. But you can’t go wrong with advanced LED lighting front and rear, standard LED taillights nestled in traditional red lenses. Available in different 8 colours. Size matters, and for customers shopping for a luxury subcompact that feels more like a compact (or maybe a mid-size if you’re a tiny person), Cadillac’s new entry might fit the bill if the larger XT5 isn’t in the cards. Overall, the 2019 XT4 is a small utility done right. It marks most of the boxes, from a 237-hp engine outdoing the competition, including the Germans like the Audi Q3 and Mercedes-Benz GLA, to the spacious interior loaded with new tech. Again, Caddy’s new subcompact is everything you’d expect from the storied brand all neatly bundled into a nice little package without any compromises.